→TSH Levels During Pregnancy: What’s Healthy & Normal? TSH Levels During Pregnancy: What’s Healthy & Normal? Pregnancy puts extra strain on thyroid function. This is especially true if you suffer from thyroid conditions such as hypothyroidism or Hashimoto's. If you fit into this category then you should pay special attention to your thyroid numbers while you are pregnant. This article is devoted to that topic. I want to share with you the importance of understanding your TSH level during pregnancy, why it is different from non-pregnant women, and what factors influence it. Believe it or not, pregnancy actually promotes a fairly big problem for many women around the globe. Hypothyroidism is an increasingly common hormone imbalance and its one that affects almost every system and hormone in your body. This situation is complicated by pregnancy because as your body becomes pregnant you place increased demand on your thyroid function. This means that the standard ways that we look and assess thyroid function during pregnancy have to change. We know that during pregnancy your thyroid gland grows in size and your free thyroid hormones should increase by about 50% (1). Your body must produce thyroid hormone for both you and your child while they are developing. Knowing that pregnancy impacts reference ranges for thyroid lab tests, some associations have created new reference ranges specifically for women who are pregnant. These reference ranges are for the thyroid lab test TSH (which we will discuss more below) and they are considered to be tighter when compared to healthy people and women who are not pregnant. You can see from these ranges that the pregnant reference ranges fit somewhere in between those of healthy people listed above. This is because of the increased demand that pregnancy places on your thyroid (4). Despite these, I have my own personal recommendations that I use when treating pregnant women. I discuss more about why I opt for tighter reference ranges below, but I at least wanted to introduce you to all of this information early. When we talk about reference ranges it's important that you understand what exactly they mean. A reference range is created by local lab testing companies. These numbers are supposed to represent the average numbers of all people in your local area. Lab companies create these ranges by taking information and lab results from thousands of people and then aggregate the data using statistical analysis to create the reference ranges (5). The goal of these ranges is to include 95% of the population within the ranges provided. This means that 2.5% of people tested fall below the reference range and 2.5% of people fall higher than the range provided. This idea is very important, especially when it comes to pregnancy and TSH testing. The reference ranges provided above based on trimester (the 0.1 to 2.5 for first trimester and so on) should only be used if your local lab company cannot calculate the TSH reference ranges for pregnant women who live local to you. You should NOT be using generic reference ranges when it comes to your TSH level during pregnancy because the TSH level can vary based on geographic location, ethnicity (6), and other factors such as your weight and metabolism. It's better to CREATE reference ranges based on your location than to use the generic reference range provided above. Unfortunately, not all lab tests do this for pregnant women because there simply isn't enough information available. It's not always clear if a woman is pregnant early on which can skew the data one way or the other. Because of this, I've created tighter reference ranges which take this factor into account. The information I've referenced above is recommended based off of several studies. Most of the studies that we have on pregnant women include gathered information and data, not true double blind, placebo controlled tests (because it's not ethical to perform such studies on pregnant women). Furthermore, the information here is generalized, but we know that each person is unique and different. Normal TSH levels based off of individuals, age, ethnicity, and numerous other factors. So how can we create a "standard" range and then apply it to everyone? In addition, we know that newer studies have shown that a healthy TSH (for those who are not pregnant) is probably less than 2.5 (7). 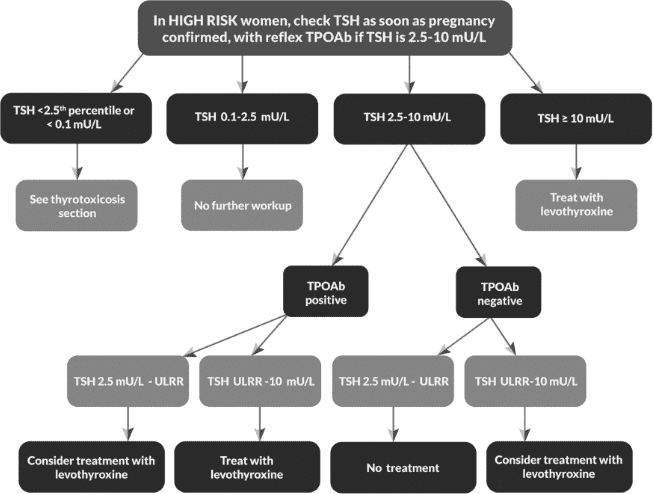 So how can studies of healthy individuals show that a healthy TSH is less than 2.5 and then recommend that same level for pregnant women knowing that pregnancy places an increased demand on the thyroid? How is it possible for some women to be completely "normal" with a TSH of 0.1 (which is within the reference range) ranging all the way up to 2.4? It doesn't make a lot of sense, but this is the data that we are left with and we have to sort it out. My personal recommendation and feeling, based off of treating hundreds of people, is that a healthy and normal TSH is probably much closer to 1.0 in the nonpregnant state. With that in mind, I feel that using much tighter reference ranges for the TSH, especially during pregnancy, is warranted. Why do I make these recommendations? Because the risk of keeping the TSH in the low range is minimal and it outweighs the potentially negative effects of low birth weight and a low IQ in your child. Using these tighter reference ranges may result in slightly more patients who experience thyroid medication-related side effects, but it also dramatically reduces the risk of negative consequences to the baby. In my opinion, this is a trade-off worth making. If you are a woman who tends to be more sensitive to medications and you are someone who experiences heart palpitations with thyroid medication then you can aim for closer to the 0.5 range. If you are a woman who struggles with hypothyroid symptoms (hair loss, constipation, fatigue, weight gain) then you probably want to aim for the lower end of that range. The logic behind the tighter range is that we are staying within the "normal" reference range provided by the clinical studies (so we are not breaking the rules) but we are staying in the top 70-99% of that reference range. What Does Your TSH Mean? We've been talking a lot about the TSH so far but I haven't really explained what it is and why it is important. The TSH stands for Thyroid Stimulating Hormone and it is one of the lab tests used to assess thyroid function in both pregnant and non-pregnant women. Your body produces TSH to stimulate the thyroid gland to produce thyroid hormone. It sounds simple to understand, and it is, but it's a little bit counterintuitive. A low TSH is usually an indication of hyperthyroidism while a high TSH is usually indicative of hypothyroidism. In pregnancy, a high TSH is an indication that your body is not producing enough thyroid hormone which means you may need to use thyroid medication. As you take thyroid medication your TSH will begin to lower. So, if you become pregnant and find that your TSH is 5.0 that is an indication that you need to take thyroid medication to help supplement the hormone that your body is producing. As you take thyroid medication your TSH will fall to a lower level. Doctors use the TSH to help determine how much thyroid medication you may need. You find out you're pregnant and find out your TSH is 5.0. Your doctor starts you on 50mcg of levothyroxine thyroid medication and your TSH lowers to 2.6. 2.6 is outside of the recommended range of 0.1 to 2.5 which means your thyroid is not optimized. Your doctor then increases your dose to 75mcg of levothyroxine and rechecks your TSH. Your follow up TSH is now 1.8 which is within that normal range. *Note: I recommend further changes to your medication at this point, especially if you are symptomatic (weight gain, hair loss, constipation, dry skin, etc. ), but you technically are "normal" by testing standards. This is generally how the TSH is used both in pregnancy and outside of it. Even though we are discussing the TSH in this article, it's still important to know that they are other tests that can also be used (and should also be used) to test your thyroid. These other tests include the free thyroid hormones free T3 and free T4. These tests should almost always be ordered with your TSH because it puts the TSH into context that you simply don't have if you only look at the TSH. It's certainly possible for your TSH to be 1.8 but your free T4 or free T3 to be low. And in this situation, you would want to continue treatment to optimize your free thyroid hormones. If you have a high TSH (or known hypothyroidism prior to becoming pregnant) then there are special changes that you must make once you know you are pregnant. These changes include increasing your dose of thyroid medication immediately upon finding out or suspecting you are pregnant. Because your child, especially during the early stages of development, is reliant upon your thyroid hormone until it can produce its own thyroid hormone. During the first trimester, your child will be relying upon your thyroid gland for its thyroid hormone. And, if you are taking thyroid medication your ability to produce thyroid hormone is limited. This is why most doctors recommend that you increase your dose of thyroid medication anywhere from 20 to 50% (and even all the way up to doubling your existing dose). In fact, this recommendation applies even if you miss or skip a period and suspect you might be pregnant. The most critical time in development often occurs before you even know that you are pregnant. Because of this, it's very important that you pay attention to your body and try to find out if you are pregnant as early as possible. 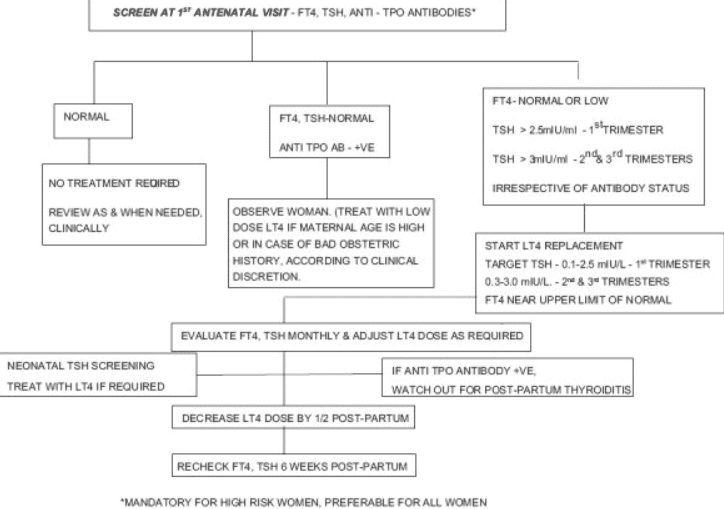 Most physicians recommend the use of T4 only thyroid medications such as Synthroid and levothyroxine during pregnancy. But does that mean you can't use other thyroid medications? In fact, many women use other thyroid medications such as NDT and cytomel/liothyronine safely during pregnancy. Instead of focusing on which medication you use, you should focus on your thyroid lab tests (TSH, free t3, and free T4) and how you are feeling. If you are experiencing the symptoms of hypothyroidism, even with a TSH of 2.4, it may be time to adjust your dose slightly higher to compensate. You can discuss these options with your Doctor. My goal here is to simply provide you with information so that you can become knowledgable on the subject and make the best choices for both you and your baby. TSH levels vary based on a number of factors including your age, weight, ethnicity, and metabolism. It's important to take all of these factors into account when you are pregnant to ensure that your child gets sufficient thyroid hormone. You can take into account these variables by looking at special calculated pregnant ranges based on your geographic location (which should be provided by the lab company which runs your tests). If these tests are not available then you can use the standard reference ranges provided above. If you are concerned about the long-term health of your child and want to provide them with the best possible thyroid environment, then I would recommend you look at my tighter reference ranges. Are you taking thyroid medication? Do you feel that your medication is optimized?